A solid block of 1 1/8" optic crystal, the edges are beveled to give the piece dimension and reflect light and color. Personalize the large engraving area for a modern design in recognition of achievement. This premier crystal is packaged in a velvet lined gift box. This free-standing solid crystal piece is faceted on the sides and back with a flat front and slanted top. The facets catch and reflect the light lending a dramatic effect to the understated elegance of this piece. Personalized to honor your top performers or milestone events and packaged in a velvet lined gift box, this tower is the ultimate in recognition. 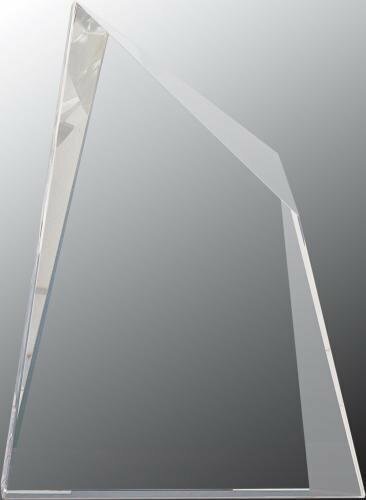 The beveled, faceted edges of this crystal rectangle give this free-standing award of clear and black crystal dimension and depth. The top clear crystal has a flat rectangular front area and tapers down to the black bottom or base of the piece. This unique crystal piece is packaged in a velvet lined gift box, and can be personalized to recognize and honor the top performers in your organization. This free-standing solid crystal piece is faceted to create a large diamond shaped area on each of the 4 sides. The facets catch and reflect the light lending a dramatic effect to the understated elegance of this piece, and offers options for personalization. Packaged in a velvet lined gift box, this tower is the ultimate in recognition. This substantial premier crystal piece is 1-1/2” thick at the bottom and tapers to ¾” thick at the top. The bevels cut into the sides catch and reflect light and color, and serve to highlight and frame the large personalization area. The top of the crystal is cut to a wave design, that combined with the other attributes creates dimensionality and visual appeal. Available in 2 sizes and packaged in a lined gift box for added elegance, this stunning free-standing crystal is the ultimate in recognition of excellence. sure to be treasured recognition of accomplishment. This blue crystal diamond rests on two blue crystal columns mounted on a clear base. The diamond is beveled on the back at the top and on the front at the bottom giving it a 3 dimensional look. 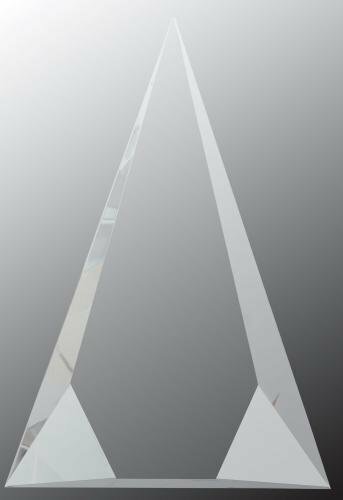 Personalize the large engraving area of the diamond to recognize the top achievers and important milestones of your organization. This elegant crystal is packaged in a velvet lined gift box. This five sided crystal column is mounted on a black crystal base and slants at the top to show a flat frosted star. Personalize the column, the base or both to recognize the rising stars in your organization. This premier crystal piece is packaged in a velvet lined gift box. A 2" crystal globe sits under a stately crystal arch on this premier crystal award. The arch provides ample room to tell your top performers their achievement is recognized and appreciated. The Crystal Globe/Dome comes packaged in a lined presentation box.